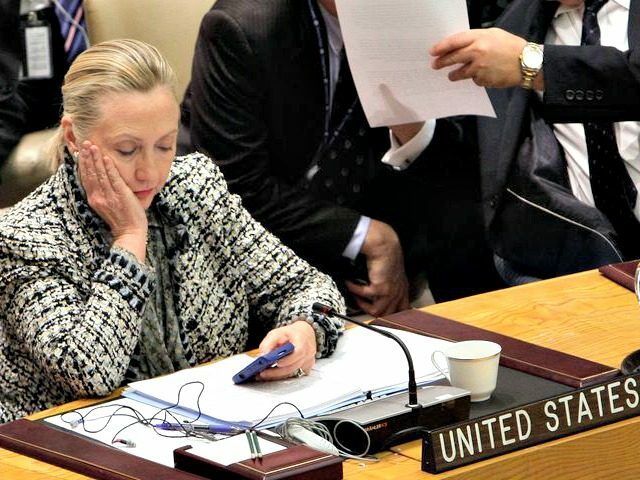 WASHINGTON — Newly released emails show that Hillary Clinton was aware of the security problems with her personal Blackberry but used the device anyway for sending and receiving emails. Breitbart News published an extensive report Wednesday detailing six different pieces of evidence that could spell trouble for Clinton as she faces an FBI investigation being worked on by 147 different agents. Clinton was warned in 2009 to stop using her BlackBerry because her device suffered a security “vulnerability” when she visited East Asian countries, including China, on her first official State Department trip. That warning came days after she acknowledged to Hyman that she couldn’t use her Blackberry in her office. After this mornings “management meeting” with the A/Secys, Secretary Clinton approached Ambassador Boswell and mentioned that she had read the IM and that she “gets it.” Her attention was drawn to the sentence that indicates we (DS) have intelligence concerning this vulnerability during her recent trip to Asia. Secretary Clinton has asked Ambassador Boswell for this information. Please prepare a short informal paper OR provide the A/Secy with a briefing on this matter. Your assistance is appreciated. The Secretary did not provide a “due date”…BUT the Ambassador would like to close this loop as soon as possible. But Clinton continued to use her BlackBerry as late as 2011, two years after this warning, according to Sherman. Sherman spoke about Clinton’s BlackBerry use in a speech that was quietly recorded on video and released right before the Iowa caucus, which Clinton barely won over Bernie Sanders. Former top Clinton aide Cheryl Mills has already been interrogated as part of the federal investigation, but Clinton has yet to be called in.